The following article describes an idea currently under consideration within the Global Climate Convergence process . . .
You may think that Wall Street will change course and lead our economy in a new, climate-neutral direction. Or you may expect Washington D.C. — or Beijing, New Delhi, Brussels or Moscow — to decisively reduce greenhouse gas emissions and protect people and the planet. If so, read no further. But if you are unwilling to entrust your future to the money men and the political class, then consider this: Regardless of who you are, the person who holds the most power in the world to end the climate crisis may be you. One way to guarantee an end to the climate crisis is to stop doing the things that are heating the planet. Stop fossil fuel production and use. Stop greenhouse gas emissions. Stop rainforest devastation. And since the corporate and political capitals of the world are unwilling to stop themselves, we must stop them ourselves. We can stop them by refusing our participation and cooperation. We can stop them by withholding our labor. By folding our arms we can halt the machine responsible for the climate crisis and in one fell swoop create the space for the new, green economy to take root. We should go on strike. A global climate strike is a next step in the international uprising that insists that another world is possible. That uprising has taken to the streets in the tens of millions. It has even occupied capitol buildings and the halls of capital. Yet the street demonstrations have yet to work because most global elites are not listening and will not listen. And while the occupations and blockades have succeeded here and there, the bulldozers of profit keep moving everywhere else. It is time to shock the system with a global climate strike. What makes a strike different from mere protest? 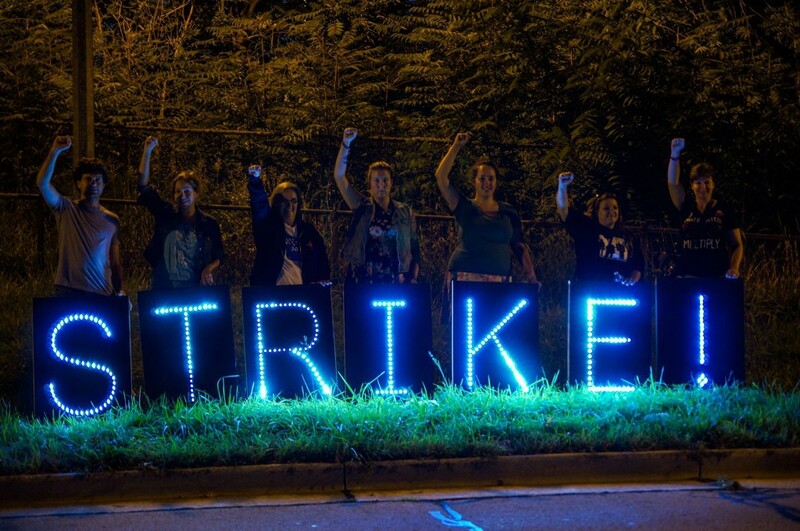 A strike is an economic stoppage. A strike does not plead. It does not demand. It simply does. 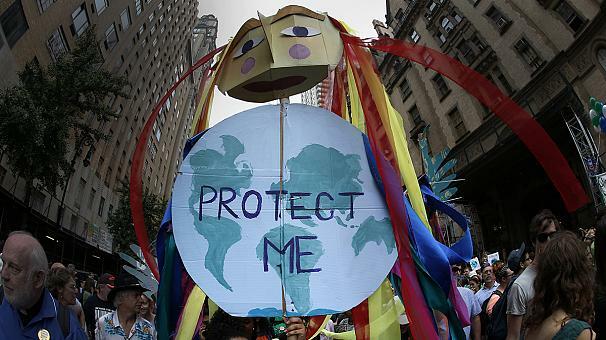 A global climate strike stops the economic and political systems responsible for the climate crisis. Workers and students stop their usual work. Machines and money stop moving. And in anticipation, communities step forward into the breach to build the new economy that puts people and planet over profit. A global climate strike might last a few days, or weeks, or at some point, it might move forward without end. It will be a global strike because the climate crisis is not a national problem, it is a systems problem. The system of global capitalism dominates much of the world and it will take a worldwide movement to stop this sytem. The strike may begin in 10 or 20 countries, and in particular economic sectors, but from there, it must spread. When a strike reaches critical mass, capitals will respond. Their bottom lines will demand it. They will try to appease us, and when they do, we should call that progress. But as we continue forward, they will attempt to divide and destroy us. For this reason, the hardest part of winning a global climate strike will not be its beginning, but its end. Nonetheless, we must begin. For years now we have heard the word “wait.” Wait until the scientific consensus on the causes of climate change has increased from 90% to 99%. Wait until renewable energies are price competitive. Wait until the results of the next election. Today the scientific consensus is nearly unanimous, renewable energies are price competitive, and elections have come and gone. Yet the world’s capitals continue to prop up the fossil fuel industries and to feed the climate crisis. The result is an atmosphere that holds far more carbon dioxide than the ecosystems our lives depend on can tolerate. All of us are headed for a world 10°F hotter than preindustrial levels. That is a world that cannot sustain human civilization. Every month of waiting deepens the scarcity of resources and opportunities to change course. Climate change is expensive. When food production is disrupted, food prices go up. When cities must be rebuilt, resources are expended. When millions flee their homes, space must be made for them. All of this intensifies scarcity and inequality and brings about a more dangerous global society. It is absolutely true that human beings now possess the technologies and understandings necessary to recreate our economy on a sustainable, democratic and fair basis. Today, we have the ability to shift to an energy grid that is 100% renewable by 2020. We know how to produce healthy food and healthy cities that cost less and heal the planet. The knowledge of how to do this is contained in every one of the tens of millions of people around the world currently employed in building the new economy. A global climate strike will open space for the new economy to expand rapidly. It will be an opportunity to innovate and showcase sustainable solutions at the community level. That expansion will mean new jobs for the unemployed and the overemployed. Those jobs are safer, healthier and, by definition, sustainable. Those jobs also tend to be more decentralized, and for this reason, supportive of a more democratic society. The world’s capitals will not end the old economy or deliver the new one. We can’t wait any longer because every day of waiting reduces our window for action. We need not wait because we already hold the knowledge needed for creating the new economy. And because a global climate strike can stop the machine responsible for creating the climate crisis, the most powerful person may be you. You may be the person who can turn the climate’s breaking point into a tipping point by bringing others around you into a global climate strike. The authors would like to stay in contact with you. Click here to stay in contact about the global climate strike idea. Ben Manski has been a union member and rank and file activist for over 20 years. He founded the Liberty Tree Foundation and other pro-democracy organizations. Dr. Jill Stein was the Green Party’s candidate for president of the United States in 2012 and is an organizer for climate and economic justice.